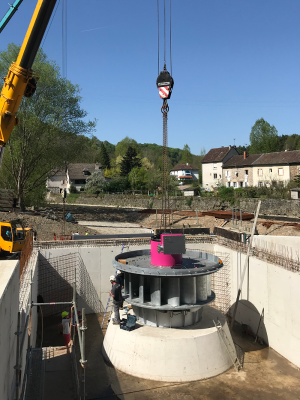 On Thursday, 19th of April, the DIVE-Turbine with the biggest runner diameter so far reached the construction site of Claredent, a hydro power plant at the river Corrèze in central France. 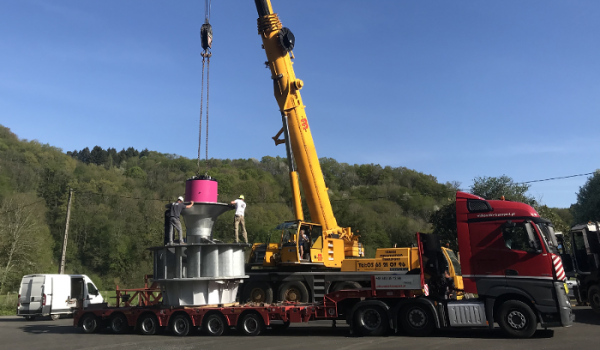 The preassembled turbine with an overall diameter of four meters and a weight of more than 20 tons had been on a four-day trip on a heavy-load truck from the German DIVE-factory to the site of Claredent. 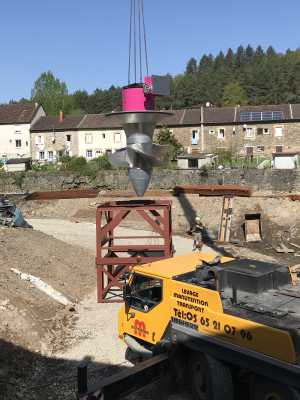 After the arrival on site the installation of the turbine was accompanied by a whole team of installation staff, crane drivers and journalists. Only several hours later it was completely installed and fixed to the civil works. The new turbine replacement is part of the modernization of the power plant. As ecological aspects play a big role, a new fish friendly rake system will be installed and the turbine is a fish friendly turbine with only three runner blades. The installed capacity of the low-head turbine is 310kW at a head of 2,14m. The start of operation is planned within summer 2018. 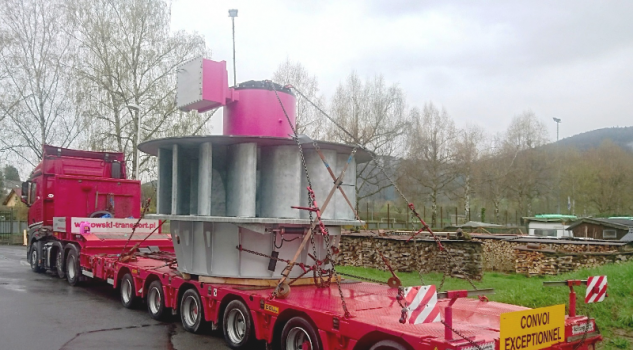 Preassembled DIVE-Turbine ready for transport to France. Unloading the DIVE-Turbine at the site of Claredent. The units of generator and turbine are installed separately after the control unit. The fish friendly turbine has three runner blades.